Framed Size: 36.375 X 26 in. This is the interior of the College of Magical Knowledge, warmed up by carpets. These are not dwarves with names. These are simply Fellowes of the College and we have been allowed to go backstage and see them get ready for the day. Part of the humor of the piece is that all the multiple layers are part of the same garment. The outfits are prefabricated to some extent, like theatrical costumes. 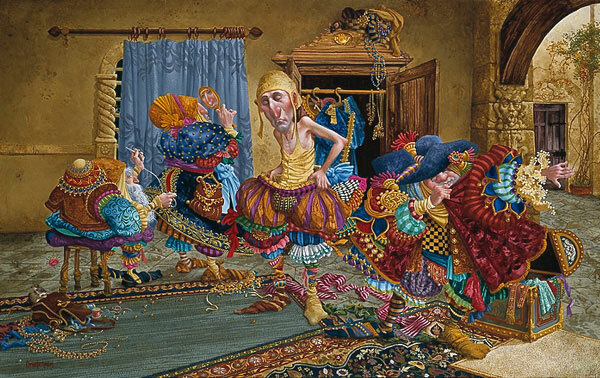 Although they're pretending that it's all "oh, ho-hum, time to get dressed," they're pretty caught up in what they're doing - despite the look of disorganization. This is actually serious business. By the way, these mice are not nasty rodents that eat holes in their outfits. They are friends, fellow dwellers and part of the entire environment.